Muslim families displaced in the latter part of 1990 are now returning to Jaffna district and occupy their houses and lands. Majority of the Muslim IDP families are resettled in areas close to Jaffna town, sources said. Five Muslim IDP families returned to Jaffna district to resettle in Chavakachcheri town have been now left in the lurch because of their houses and lands are located the HSZ, sources said. 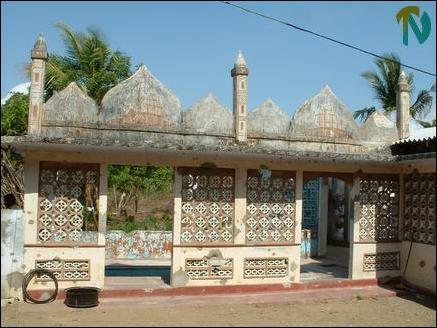 The damaged Chavakachcheri Jumma Mosque. The Chavakachcheri Divisional Secretary has informed the Jaffna command of the SLA that these Muslim IDP families have been refused permission to occupy their houses and lands in Chavakachcheri town. Hence these families have been given temporary shelter in the damaged Jumma Mosque in Chavakachcheri, sources said. During daytime these Muslim IDP families stay with their friends and return for the sleep to the Jumma Mosque. The leader of the Sri Lanka Muslim Congress Mr.Rauff Hakim has made an appeal to the President Ms Chandrika Kumaratunge to help the Muslim IDPs to resettle in their houses and lands in Chavakachcheri town, sources said.